It's hard to judge from a (mere) pic, just how steep those cables are. When you're on them, they feel almost vertical - like after you climbed the first 100 ft, if you were to jump out, you'd hit the bottom before the side. I think they incline at a 60-degre angle. 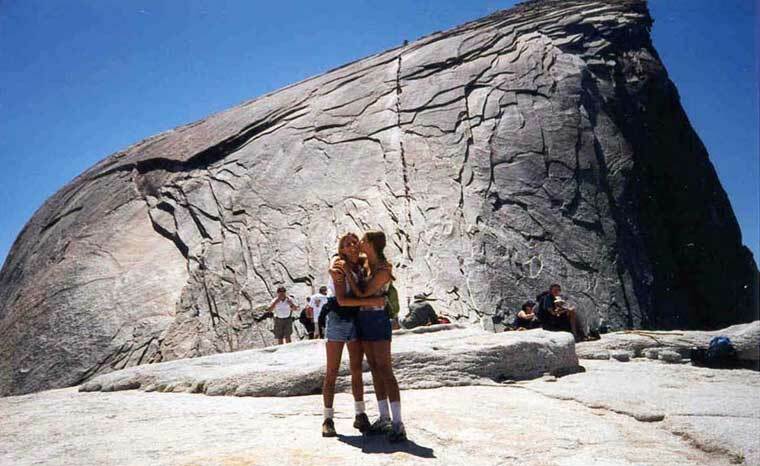 People from all over the world hike Half Dome. Not uncommon to hear two diff languages being spoken at the same time (not including English). People coming back down encourage you in the climb, "You're doing great - only a little ways longer - it's worth every step - you can do it." We hiked up with a 50-yr-old man name Mostyn from Wales, who'd been hiking all his life, mostly in Europe. He took good care of us, & even gave us his water when we didn't ration correctly & ran out. I overheard people saying that the cables were built with prison labor, and that not a few died in the process.